San Rafael Therapist: Bayside Marin Treatment Center - Therapist 94901. Send A Message To Bayside Marin Treatment Center. The expert clinical team at Bayside Marin believes that addiction must be viewed as a symptom of the emotional suffering that is caused by an untreated mental health condition such as anxiety, depression, or bipolar disorder. As such, they craft individualized treatment plans that identify the unique factors that have contributed to each patient’s struggles with drugs and/or alcohol. These underlying concerns are then addressed in the therapeutic environment, and each person is provided with a variety of opportunities to heal in the present. relaxing setting, they can escape the pressure of daily life and instead devote all of their energy to meeting their personal goals for recovery. Each day will consist of an array of different therapeutic activities, and patients will have access to the precise interventions that they require to achieve lasting sobriety. Initially, some patients benefit from engaging with Bayside’s detoxification, or detox, program. This medically-monitored program allows individuals to cleanse their minds and bodies of substances of abuse prior to accessing other types of support. Throughout this process, patients’ safety and comfort will be paramount, and certain medications may be administered that can help ease the pain of withdrawal. As they gain strength, patients who attend detox will be encouraged to begin attending other therapeutic activities such as individual counseling, group counseling, experiential therapies, and our family program. ways of interacting with others. 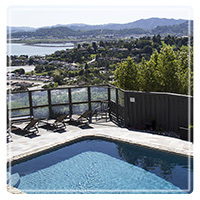 With individual counseling, patients have a confidential, one-on-one session with an assigned counselor with whom they can process past issues, process the challenges and successes of treatment, and plan for life after leaving Bayside Marin. Group counseling is an excellent means of combating the isolation that many individuals who have struggled with chemical dependence feel. With support from peers, men and women learn that they are not alone in their experiences, and gain strength from each other. The Family Program at Bayside is designed to help families learn how to best support their loved one in their recovery journey, to learn about addiction and mental illness, and to repair damaged relationships. Experiential therapy at Bayside consists of many types of activities such as: art therapy, massage therapy, acupuncture, meditation, and therapeutic gardening. These activities support healing on a deeper level, establishing a connection between the body and the mind. Bayside Marin is dedicated to continuing to support their patients long after they leave treatment, and they are pleased to offer programs for alumni who are in need of additional care. Together, with help from Bayside, patients can achieve a substance-free life and learn to manage symptoms that have impacted their mental health. As a member of the Bayside Family, a healthier, brighter future can begin today.